The very first Swarovski SCS crystal figurine was the Swarovski ‘Togetherness’ Lovebirds. These Lovebirds were a remarkable work of art. Swarovski ‘s efforts on the overall presentation and package would not be overlooked. The SCS Lovebirds were the first figurines to have a custom box, which would be suitable for use with no other figurine. 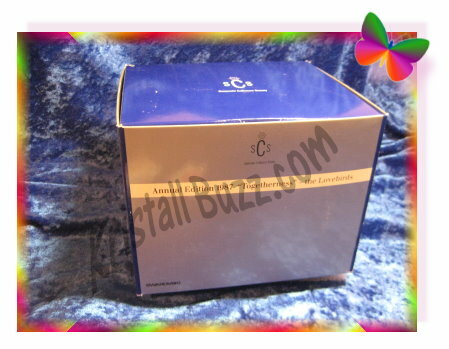 This Swarovski SCS box was primarily silver and royal blue in color. On all 4 sides, collectors can read the text ‘Annual Edition 1987 “Togetherness” – the Lovebirds’. The Swarovski–assigned part numbers can be found on bottom in tiny type. The Swarovski Lovebirds Box reference number is DO3E861. The Lovebirds Box can also be found using another reference # DO1X861B, which was originally used in the Warner’s Blue Ribbon Books on Swarovski Price Guide. The foam was specially made to securely package and transport the Swarovski SCS Lovebirds. As can be viewed in the image, the back side of the Lovebirds rests in the largest indentation. The smaller indentation in the foam closes over the base keeping the figurine firmly in proper position when the foam-enclosed figurine is placed into the box. A special thanks to Jane Warner, co-author to Warner’s Blue Ribbon Books on Swarovski for consulting on the Swarovski Lovebirds Box article. Regarding availability and replacement value, the SCS Swarovski Lovebirds Box is becoming harder and harder to find. For one, early on, collectors were unaware of how important it would become to save the original boxes. Even for collectors who did save them, the Lovebirds boxes did not tolerate frequent usage…..the cardboard was thin and would easily tear. Opening and closing them even a few times could result in tears on several sides of the box. While the picture shows a box in excellent condition, for the most part, collectors should not expect boxes to look this clean. I did not find any in the online auctions. In the last completed transaction at Crystal Exchange America, Swarovski Lovebirds Box sold in excess of $700 with their commission!